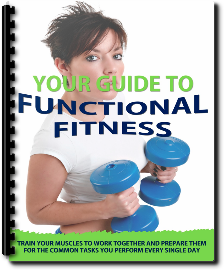 Many people have never heard about functional fitness training, so it comes as no surprise most of them are wasting their time on movements and exercises that are not best suited for the body. In its simplest terms, it is training methodology that most closely mirrors movements of everyday life, and those of our prehistoric ancestors. Movements such as getting up (squats), raising arms overheard and extending (shoulder presses), pulling your body up( pull ups) and pushing the body up from a prone position ( pushups or bench press) form the core movements of a functional fitness program, with other movements such as lifting objects and jumps also being important supporting moves. As you may now notice, the need for machines are all but eliminated, making functional training perfect for persons who wish to train at home, or wish to improve their body without having to spend a ton of cash. What if, you can perform those same functional movements, while making your core super human strong? It’s very achievable, by simply employing the use of an ingenious device- the Bosu ball. This variety of the classic squat, in addition to helping you develop massive quad, glute, and hamstring muscles, when performed on the Bosu ball calls into play a range of stabilizing muscles, primarily the obliques and erector spinae of the lower back. Performed 2 or 3 times weekly, it is important to slowly increase the number of repetition (and subsequently weight) performed, in the interest of safety and improving core strength and balance. When you can perform 3 sets of 15 reps, it’s a good time to add weight. This movement may sound complex to the untrained eye, but it mimics a natural range of motion of the human body. To perform, stand upright on a Bosu ball, with a medicine ball in both hands at shoulder height. In one explosive movement, slam the ball towards the ground, allowing your knees to bend and hips to move backwards (as if to sit). Rise back to the start position, and repeat the movement. Be sure to catch the ball upon its ascent, or you will be forced to leave the Bosu ball after each repetition. This movement mimics the natural jump technique, in that it includes an impact reducing tuck at the end. To perform, stand about 18-24 inches in front of a Bosu ball (flat hemisphere on the ground), jump and twist in one smooth movement, so that you land facing opposite to your original direction. Take one jump off the Bosu ball (backwards) and lean back into a tucked position (on your back). This exercise develops explosive jumping strength while being low impact on the knees. Typically, the landing motion of a jump can induce massive impact trauma, leading to fractures or joint issues. The second jump and tuck blunts impact. To perform, assume a push up position with the spherical side on the ground. Ensure hands grasp tightly the two sides of the ball. In a slow controlled motion, lower your chest to the edge of the ball, and push up in an explosive manner. At first, this movement may be difficult to perform because of the added element of balance. Aim for 5 reps your first try, and increase by at least 1 rep with each subsequent workout. This exercise is extremely efficient at developing upper abdominal and lower abdominal core stability, as well as lower back strength. To perform, kneel with one leg on the Bosu ball, and both arms of the ground in front of you. Extend the other leg straight back, and raise the arm of the opposite simultaneously. In its final position, your body should be in a position parallel to the floor, with only one arm on the ground, and one knee on the ball. Alternate sides and repeat 10 times. Bosu ball training can easily be incorporated into functional fitness training, and if anything, is likely to accelerate the development of core strength. Just start slow and progress on a per workout basis. Get help from a trainer experienced in functional fitness, or check out many of the free video demonstrations on YouTube to be sure you are performing the functional exercises correctly.